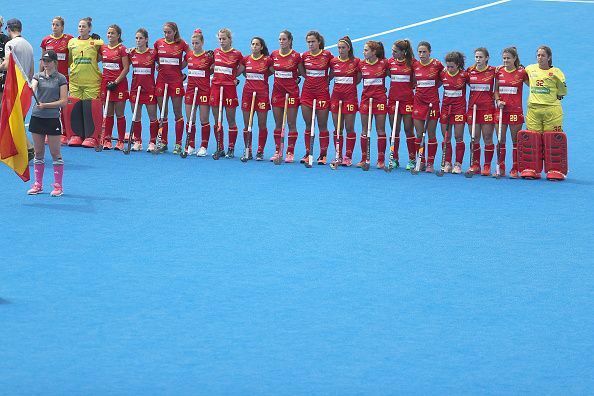 The Spain Women's Hockey team falls under European Hockey Federation and is associated to Real Federación Española de Hockey(Royal Spanish Hockey Federation). The Spain Women's Hockey team played one of their first major tournaments at the 1974 World Cup, where they were positioned sixth in the final standings. The team won a gold medal in their first ever appearance in Summer Olympics in 1992 at home. The Spain Women's Hockey team was placed fourth in the 2000 Summer Olympics. They earned fourth spot in the World Cup in 2006 and fifth position twice in 1976 and 1990. Spain earned silver medal twice in 1995 and 2003 in the EuroHockey Nations Championship. The Spain Women's Hockey team are in Pool C along with Argentina, South Africa and Germany. They are currently seeded eleventh in the FIH World Rankings and face tough competition from teams like Argentina and Germany. Maria Ruiz(GK), Rocio Gutierrez, Carlota Petchame, Carola Salvatella, Maria Lopez, Berta Bonastre, Cristina Guinea, Carmen Cano, Maialen Garcia, Lola Riera, Julia Pons, Begoña Garcia, Xantal Gine, Beatriz Perez, Georgina Oliva(Captain), Alicia Magaz, Lucia Jimenez and Melanie Garcia(GK).